Follow those rhyming terms and conditions, people. Remember Elon Musk’s Not-A-Flamethrower — a propane-fuelled, oversized barbecue starter that looks more like a modified Nerf gun? It might have been a joke when Musk first posted about it on Instagram in January, but it got deadly serious when 20,000 people pre-ordered it. On Saturday, the first wave of 1,000 people have received their devices, at a party outside Los Angeles, The Verge reports. And things are… already predictably messy. In an effort to save the Boring Company from the many inevitable lawsuits that will result, Elon Musk tweeted a Dr. Seuss-style terms of service reminders. But, after all (and despite its name), the company is selling a flamethrower, which meant that people were still using it to light blunts and tiki torches, allow their kids to have a go or cook steaks. These are, for the record, very bad ideas: in an effort to cook some steak and popcorn, YouTuber Justine Ezarik (better known as iJustine) managed to light her artificial lawn on fire. The device may not be as foolproof as you might hope. “I didn’t even hit the trigger,” she shouts over the sound of escaping gas erupting into a giant flame right in front of her in a recent video. In the same video, she seemed to have trouble getting it to light. These are not desirable qualities of a propane-leaking flamethrower. The Boring Company not a flamethrower. Reposted from @teslamotorsclub @myteslaadventure. Not everyone was as enthusiastic as Musk about putting flamethrowers in the hands of thousands. 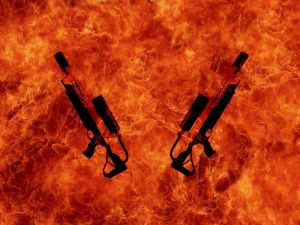 In fact, the state of California even tried to stop the flamethrowers from being sold by introducing a bill, prohibiting the sale of “flamethrowing devices.” But the bill is currently being held in committee after failing to get sufficient votes to pass, opposition by gun rights activists, and concerns over costs associated with handing out flamethrower permits. So far, there have been no documented cases of people who have dialed 911 due to a Not-A-Flamethrower-related incident. But put them in the hands of some 20,000 people and we’ll probably see at least another instance or two of people getting hurt or acting recklessly. That is, if the flamethrowers get there. At a Boring Company event on May 17, Musk promised to start shipping the remaining 19,000 flamethrowers in two weeks. So they are already behind schedule. Which is kind of Elon’s thing. But it’s also not clear how, exactly, they’ll be shipped. According to The Verge, Musk ran into “delivery challenges,” since UPS won’t deliver something with highly flammable propane, Musk hinted that Boring Company employees might personally deliver the 19,000 flamethrowers. Assuming that everyone who ordered a flamethrower will, in fact, receive it, we’re not here to judge what you use it for. There’s nothing wrong with lighting up some creme brûlées in the name of good fun. But be safe out there, folks.